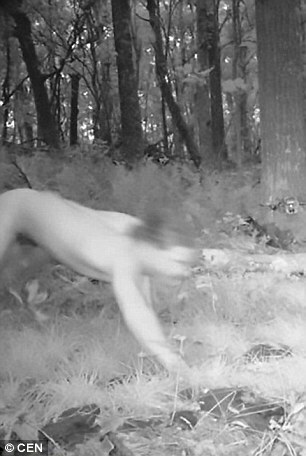 A hidden camera left in a forest to snap images of animals in the wild captured pictures of a naked man who believed he was a tiger after taking LSD. The man, only identified as Marek H from the Czech Republic, took the drug to try and treat his depression. But after taking LSD he then ran off into the Polish forest, stripped naked and starting behaving like a tiger. Later foresters looked back at the footage to try and see if they had captured any wild animals on camera. But after watching footage of the man, they handed the pictures straight over to police, who later apprehended Marek H.
The 21-year-old then confessed to police that he had taken the hallucinatory drug LSD. He said it started to work immediately and that he felt he had become a Siberian tiger. The man told police that it was then that his ‘true personality’ had woken up and that he had always connected with the animal. He added that while being high on the drug, he picked up a scent and felt compelled to follow it. In eight hours he is believed to have travelled 15 and a half miles along the Czech-Polish border, in a forested area. But because the man did not have any drugs with him, he was only fined and will not face any further charges.